Color talks, especially when choosing the color of your floral bouquet. People love to get flowers. They are the perfect gift that can suit almost any occasion and can be personalized to give it that extra special touch. If you are thinking about getting someone a bouquet for a special occasion, here is a color guide. Since red represents love, passion and beauty, people tend to give out red flowers during romantic occasions like Valentine’s Day or an anniversary. Traditionally red roses are given during these special times. Pink represents innocent love. Pink flowers are pretty and delicate. They make the perfect gift for girl’s birthdays. Any girl will be delighted with a pink bouquet of mums, English roses or Asiatic lilies. Purple has traditionally been a regal color that represents pride and success. This color is great for a bouquet when congratulations are in order. Lavender represents grace and femininity. Lavender bouquets are best given as thank you bouquets. Yellow is the color of sunshine, joy and happiness. Yellow bouquets of daffodils or sunflowers are great as get well bouquets. Blue is supposed to bring a calming effect. 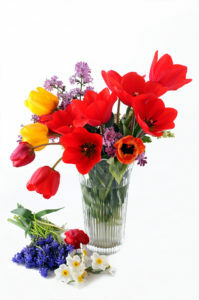 Bouquets of blue hydrangeas, irises or hyacinths are great as sympathy or “I’m sorry” bouquets. Wedding flowers and bouquets are definitely special and they must all be chosen with care. The bridal flowers should reflect the best undertones of the bride, as should the bridesmaids dresses and decor. You will find more about Brides in our other posts. Have fun picking out flowers for your loved ones!